Here is my vegan version of my shepherd’s pie. A couple of notes if you decide to try this recipe. The recipe calls for black beluga lentils because that’s what I had on hand to make this but you could easily substitute du puy lentils (french green). The mushroom gravy is not necessary – I often make this dish without but sometimes you just want some extra fat to up the comfort factor. You need a large rectangle glass baking dish to make this in. Make your wild rice. Rinse the rice and then stir it into a cup and a half of boiling water. Simmer for 5 minutes. Remove from heat and let soak in the same water, covered for 1 hour. Drain. Stir rice into 1 1/2 c of fresh boiling water. Let simmer for 25-35 minutes. Drain. While making the rice – prepare the other parts of the shepherd’s pie. Check your lentils for stones and rinse the dust off them. Put them in pot with 3.5 cups of cold fresh water. Cover and bring the water to a boil. While waiting for the water to boil prepare your aromatics. Quarter the onion. Finely chop the carrots and peel the garlic cloves. Once the water has boiled, add these to the lentils, plus the bay leaves and turn the heat to simmer. Cook for around 25 minutes. You want your lentils to be firm and not mushy. As the lentils cook prepare the potatoes. Basically if you already know how to mash potatoes this step will be very easy for you. Peel the potatoes. (Note: if you have organic potatoes no need to peel them – I love the rustic look of the potato skins in a mash.) Chop the potatoes into small pieces roughly the same size. In a large pot add enough cold water to cover the potatoes and bring to a boil (turn down to a simmer once they have reached a boiling point). As this point your lentils should be finished. Drain, and if you want you can reserve the liquid to use for stock at some future date. Remove the onion, garlic and bay leaves. Don’t worry if you can’t remove all the onion – some small pieces in the lentils won’t hurt. Season with some freshly ground pepper. If your potatoes are ready drain the boiling water and leave them in their cooking pot until you are ready to mash them. Prepare your mushrooms. Soak your dried mushrooms in warm water as directed. Slice the button mushrooms and leave some pieces in quarters. Once the dried mushrooms are soaked – slice into bite sized pieces. 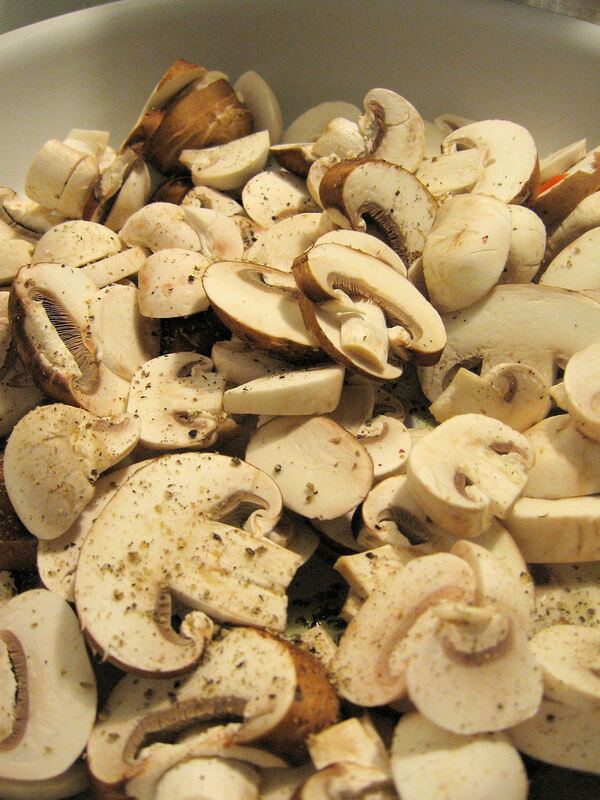 Warm the oil in a frying pan and add all the mushrooms – you want to cook them just until they lose some of their juices. Pre-heat your oven to 375 degrees F.
Now prep your base. 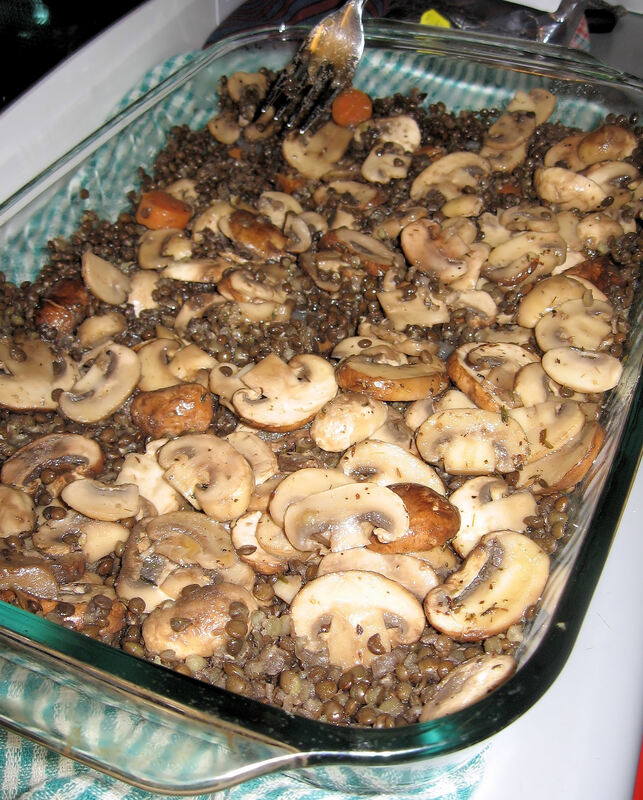 Add the lentils, mushrooms, frozen peas and wild rice. Mix together. Drain the water from your potatoes if you have not already done so. Mash them with the soy milk and margarine. Spread the mashed potatoes evenly over the base mixture. Cook for 20 minutes in your pre-heated oven. While it is cooking prepare your mushroom gravy if using. Remove from oven and spread mushroom gravy over the top. Serve with: rapini with garlic and chili peppers.